Sunday 10:45 am Worship with Sunday Club for the children, followed by coffee. Communion second Sunday of the month. Transport available if required; tel 0113 2935847 or, on Sunday morning, 0113 2370251. 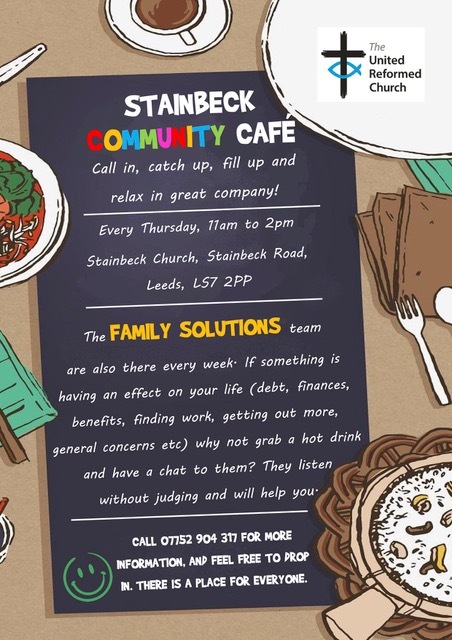 1:30 pm Stainbeck Lunch Club for the Elderly: contact tel 0113 2935847. 9:00 pm Youth Groups: usually in term-time, with InterACT and the Youth Service; contact 0113 3930600 / mob 07961535767. Check to see when running. Wednesday 8:00 pm After Eight’s: ladies’ group.Third Wednesday of the month; contacts tel 0113 2687582 / 2682011. Police Contact Point tel 101 . 2:30 pm Make ‘n’ Do: Crafts for All – Card and Board Games – Table Tennis – Free Internet Access. Relaxed, Friendly Space. With InterAct; contact 0113 3930600 / mob 07961535767. Thursday 7:30 pm Mid-week Worship: each Thursday. A short time of praise, reflection, prayer and fellowship. Communion fourth Thursday of the month.